Shakespeare in a Year: Shakespeare vs. Zombies? Getting to know the Bard one play at a time. You've seen Pride and Prejudice and Zombies and Sense and Sensibility and Sea Monsters. Now, in the same vein, we have Shakespeare Undead, by Lori Handeland. The plot synopsis from Publishers Weekly, which calls the novel "rather clumsy": "Zombies have invaded 1592 London, and it's up to William Shakespeare, whose genius with a quill comes from his extended life as a vampire, to stop them." 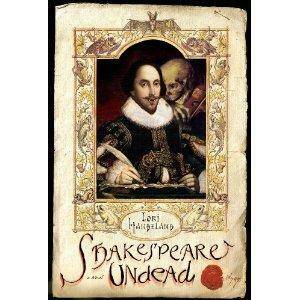 The book also gives Shakespeare a love interest, who is (of course) a zombie hunter. I must admit, I like the idea of Shakespeare as a vampire, not only because I have an embarrassing weakness for vampire fiction but also because, if he's undead, I could still theoretically invite him to my next dinner party. On the other hand, I can't really picture the Bard as an action hero. Plus, I still haven't recovered from the sheer awfulness of Mr. Darcy, Vampyre, which was recommended by a friend and which was, quite simply, the most terrible book I've ever read. So, for the time being, no classic literature/vampire mash-ups for me. Why I Cry at "King Lear"